Back around 1979 in an Illustration class in Art School , we were given an assignment after being exposed to the art of Marcel Duchamp. I don't remember the perimeters of the assignment other than this being one of the things I came up with. My generation grew up building models. Marcel poked fun at the art world. This was my way at poking fun at him,"conceptual art", and the model kits of the sixties. 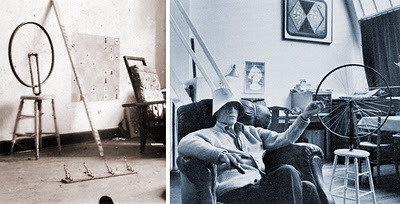 Marcel Duchamp is considered by some as one of the most influential artists of the 20th century. Before you laugh, you have to consider that he was poking fun at the art establishment but, also the first (for better or worst), to experiment with "conceptual art", decades before the term was ever coined. Marcel's words from a website I found: "In 1913 I had the happy idea to fasten a bicycle wheel to a kitchen stool and watch it turn." The two sides of the box I made. Having fun with how those old AMT and Revell model kits were sold as Three in One. He continues, "The Bicycle Wheel is my first Readymade, so much so that at first it wasn't even called a Readymade. It still had little to do with the idea of the Readymade. Rather it had more to do with the idea of chance. In a way, it was simply letting things go by themselves and having a sort of created atmosphere in a studio, an apartment where you live. Probably, to help your ideas come out of your head. To set the wheel turning was very soothing, very comforting, a sort of opening of avenues on other things than material life of every day. 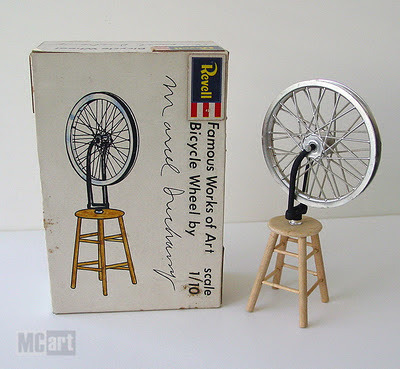 I liked the idea of having a bicycle wheel in my studio. I enjoyed looking at it, just as I enjoyed looking at the flames dancing in a fireplace. It was like having a fireplace in my studio, the movement of the wheel reminded me of the movement of flames". 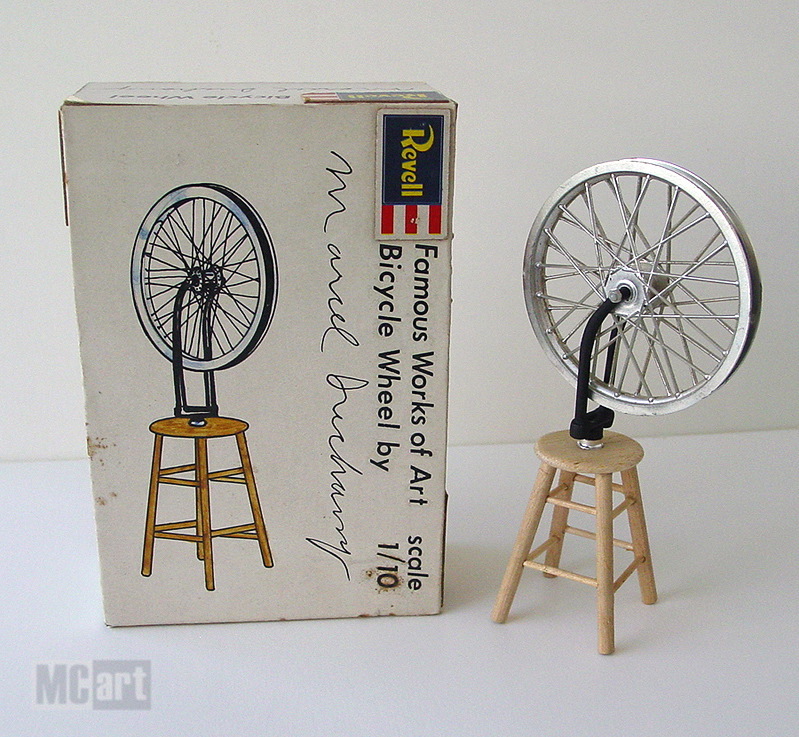 My miniature was based on the one above he made in 1951 for MOMA New York. In many ways it's the the most significant one, since it was the first to be exhibited to the art world. I'm guessing it was the one I saw in my class and art history book. 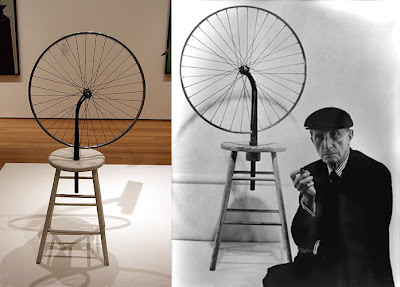 Duchamp said that the Bicycle Wheel was a "personal experiment", which was never intended to be shown to the public and wasn't formally shown in a gallery space until 1951. The original Bicycle Wheel (l1913 France), was lost. The one to the left (also lost), was the first recreation made after Duchamp came to the USA in 1916. Many mistakingly refer to the 1916 version as the original since it's the first photographed. No, that's not me (on the right), in my studio. It's Marcel wearing a lampshade with a later recreation of the 1916 version in the sixties. 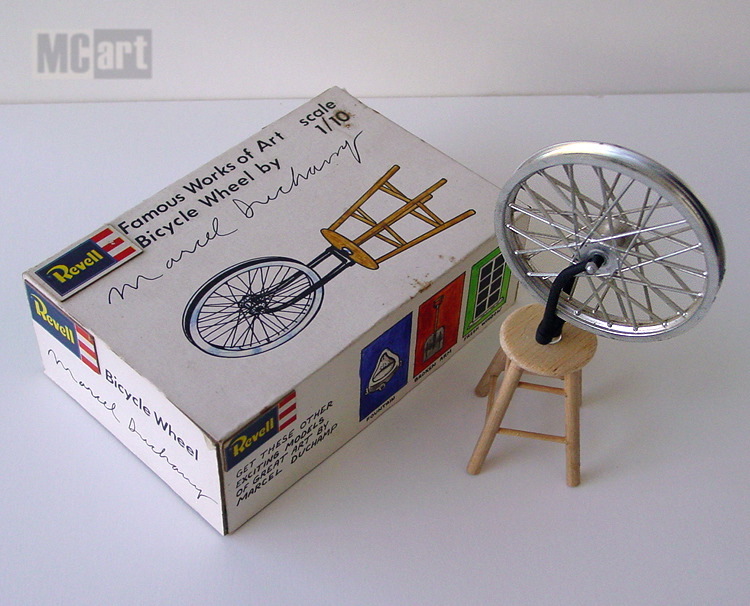 Since 1951 a few more Bicycle Wheel replicas were made. In Milan 1964, 8 were made based on the 1916 version under Duchamp's supervision and were signed. I came across one that was auctioned off for $1.7 million! For my wheel, I used the front wheel off a Revell Chopped Hog Harley model. The fork is a cut down top fork tree from the Highway Patrol Harley model with model trees bent as legs. The stool was scratch built from balsa wood, wood dowels, and toothpicks. Too me, there is something about the juxtaposition of the two objects. I also wonder if I'm the only one that can appreciate this strange combination of models from the sixties and art. Now, before you shrug his concept off as stupid, think about it. 1. 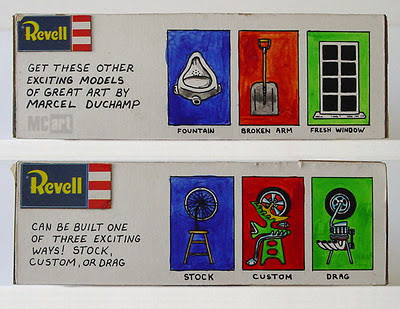 It wasn't Duchamp, rather the art community that made big deal of his Readymades. 2. It was a thinking machine for him to get ideas turning in his head. 3. Who can resist touching and turning a wheel? Who hasn't played with spinning a wheel, or been mesmerized by the criss cross visual flicker of the dance of the spokes?